Designed to improve visual discrimination, visual memory for sequence, noting likenesses and differences, visual matching, and left-to-right progression. The symbol discrimination activities for those functioning at the pre-school/kindergarten level will help to develop important skills of visual memory and left-to-right progression. 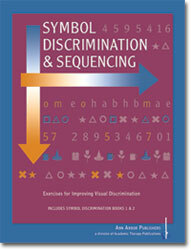 Symbol Discrimination and Sequencing activities begin with large print and only two symbols to recall. By the end of the book, five symbols (pictures, shapes, numbers, or letters) are being tracking visually.